There was a time when the limited space of a small form factor PC meant having make compromises, especially when it came to GPUs. But thanks to Zotac you can now get enough power for 4K gaming inside smaller builds, with its GTX 1080 Ti Mini. The new card measures just 8.3 inches in length, a full 2.2 inches shorter than the reference model. And while it does still require two expansion slots, Zotac says the Mini’s compact form factor will fit 99 percent of systems on the market. It may be a bit slower than some full-sized 1080 Ti cards - a base clock of 1506MHz and a boost clock of 1620 MHz – but Zotac’s card still retains the 11 GB of GDDR5 found in the standard versions, and you can always overclock it to squeeze out some extra power. The concern with using such a beefy card in a cramped SFF PC is that it may overheat. It’s a problem Zotac tackles with its custom dual fan cooling system, called IceStorm. The GPU consists of two fans; one 90mm with wide and flat blades, the other 100mm with wide and curved blades. Beneath these sit a block of wide-stack aluminum fins and five 6mm copper heat pipes. The GTX 1080 Ti Mini draws power via two 8-pin PCIe connectors for its 250W rating (a 600W PSU is recommended). And despite its small size, you still get plenty of connectivity options, including three DisplayPort 1.4, one HDMI 2.0b, and one DL-DVI-D port. 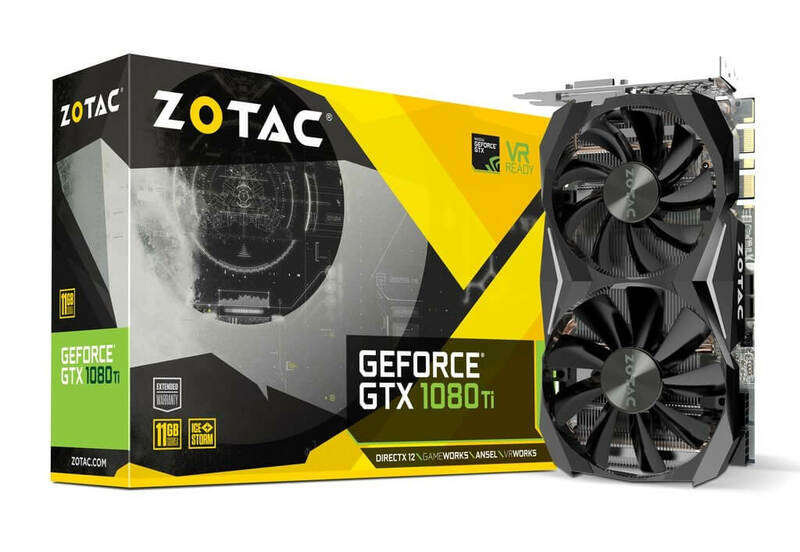 Zotac didn’t say how much the card will be or when it’ll be available, but Amazon has a listing for $562.49, with a stock arrival date of June 20 -23.